[S57] Unknown author, The Heritage of Granby, Page 172. McPherson gives Hannah's name as Smith, widow of Ward. Abel Holcombe was born on 2 November 1766 at Simsbury, Hartford Co., CT.3 He was the son of Lt. Peter Holcombe and Tryphena Case. Abel Holcombe married Lydia Lamson on 23 October 1788.4 Abel Holcombe married Roxanne Higley, daughter of Seth Higley and Mindwell Higley, on 11 February 1790 at Granby, Hartford Co., CT.5,6 Abel Holcombe died on 16 December 1809 at Westfield, Chautauqua Co., NY, at age 43.7 He was buried at Old Village Cemetery, Marcellus, Onondaga Co., NY. Seaver notes that wife may have been Roxanna Higley, but Bowman lists her as second wife. Seaver justs lists children Lydia and Polly, Granby records indicate that he had Sarah, while Weir states that he also had James Henry and Abel. The Granby Town Records and the Census list him as Abel 2nd. The 1790 Census lists 1 male and 1 female for Abel 2nd. The 1790 Census lists another Abel with 1 Male over 16, 2 Males under 16, and 4 Females. [S65] Deanna Holcomb Bowman Thomas Holcomb, Vol. I:Pg. 162. [S45] Albert C. Bates, Simsbury, Page 249. [S810] Edwin W. Strickland II, William Buell, 1-8, page 94. Lydia Holcombe was born on 3 March 1789. She was the daughter of Abel Holcombe and Lydia Lamson. Polly Holcombe was born on 3 March 1792. She was the daughter of Abel Holcombe and Roxanne Higley. The West Granby sexton has burrial in 1813, but most 1813 dates are incorrect. Naomi Holcombe was born on 12 May 1771 at Simsbury, Hartford Co., CT.4 She was the daughter of Lt. Peter Holcombe and Tryphena Case. 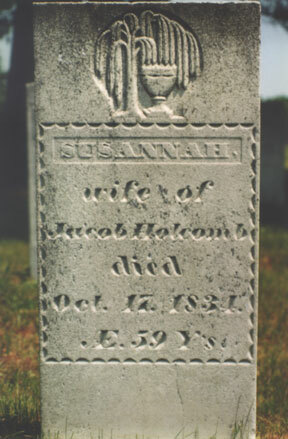 Naomi Holcombe married Seth Filer Higley, son of Seth Higley and Mindwell Higley, in 1790. Naomi Holcombe died on 20 January 1817 at age 45. Seaver lists Naomi's spouse as Taylor Higley, while Bowman lists him as Seth Filer Higley. DAR supplemental application 73223 lists him as Taylor. The Higley Genealogies list his as Seth Filer Higley. Unmarried. Deborah Holcombe was born on 15 July 1774 at Simsbury, Hartford Co., CT.1 She was the daughter of Lt. Peter Holcombe and Tryphena Case. Jonathan Holcombe was born on 25 November 1701 at Simsbury, Hartford Co., CT.3 He was the son of Sgt. Jonathan Holcombe and Mary Buell. Jonathan Holcombe married Amy Case, daughter of Capt. Richard Case and Amy Reed, on 4 December 1729 at Simsbury, Hartford Co., CT.4 Jonathan Holcombe died on 30 June 1737 at Simsbury, Hartford Co., CT, at age 35.5 Jonathan's probate is in Manwaring 3:286; inventory of £346/08/09, taken by James Hillier, James Smith, John Wilcockson 2nd. Administration was granted to Amey Holcomb the widow, 1 Nov 1737, with Azariah Holcomb of Simsbury £500. [S25] Hannah McPherson, Holcombe Genealogy, Page 194.1/Item A-8-3-3. [S23] Jesse Seaver, The Holcomb(e) Genealogy, page 47, item 209. [S45] Albert C. Bates, Simsbury, Page 103. Jonathan Holcombe was born on 19 August 1735. He was the son of Jonathan Holcombe and Amy Case. Jonathan Holcombe married Abigail Hillyer at Granby, Hartford Co., CT. Jonathan Holcombe died on 9 May 1790 at Sheffield, MA, at age 54. Chose at age 14, 7 Nov. 1746 as guardian, Joshua Boardman (mother's 2nd husband). Family bible shows birth as Feb 29, 1732. [S65] Deanna Holcomb Bowman Thomas Holcomb, Vol. I:Pgs 162-3. [S25] Hannah McPherson, Holcombe Genealogy, Page 194.1/Item A-8-3-3-1. [S94] Nathaniel Goodwin, Genealogical Notes, or Contributions to the Family History of Some of the First Settlers of Connecticut and Massachusetts, Page 287/Item 274. Joshua Boardman was the son of Daniel Boardman. Joshua Boardman married Amy Case, daughter of Capt. Richard Case and Amy Reed, circa 1738. Daniel Boardman was the son of Samuel Boardman. 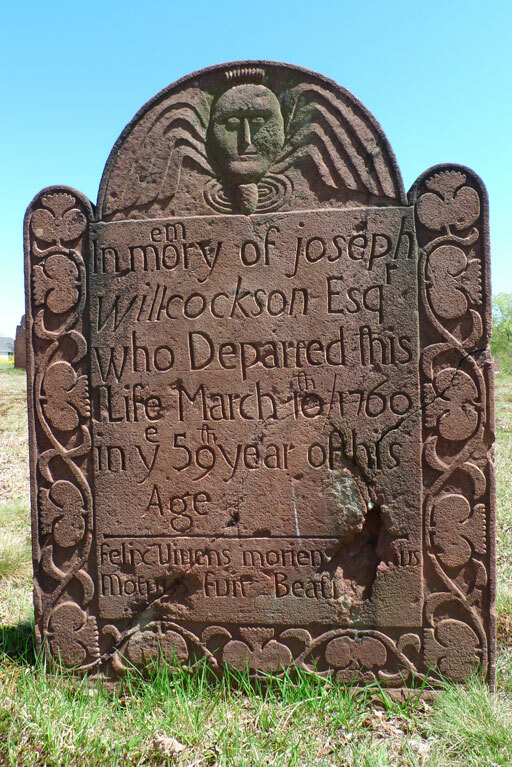 McCracken calls this child "Son", however, Seaver lists him as Jonathan, born Dec 25, 1701, died Oct 22, 1705. Seaver then lists the second Jonathan, born about 1708. Bowman lists him as (1701-1705). Baptismal record indicates birth date, Seaver shows Dec 25, 1701, other records (VR) indicate 25 Nov 1701. Probate of the estate of Joseph Willcockson, Esq., of Simsbury, case number 6026, Abstracted July 2004, by Sarah Gates Sully from a copy of the original at the Connecticut State Archive. Inventory taken 23 Apr 1760, by Nathaniel, Azariah, and Return Holcomb, the estate valued at £480 -18 - 2:2/4. Administrators, Widow Mary Willcockson, Hosea Willcockson, and Timothy Cosit, bond paid £300. Administration approved 7 July 1761. List of heirs - Widow Mary Willcockson, elizabeth wife of Joseph Holcombe, Hosea Willcockson, Mary Willcockson wife of Timothy Coset, Lusana wife of Abner Holcombe, Joseph Willcockson, David Willcockson, Mindwell the wife of Alexander Coset, Pline Wilcockson, and Theodosia Willcockson. Damaris Holcombe was baptized on 12 July 1713 at Simsbury, Hartford Co., CT.3 She was the daughter of Sgt. Jonathan Holcombe and Mary Buell. Damaris Holcombe married William Gamaliel Ward, son of William Ward. Ruth Cost Duncan on page 6, incorrectly shows Damaris as a daughter of Margaret Case and Jacob Holcomb. [S65] Deanna Holcomb Bowman Thomas Holcomb, Vol. I/Pg. 73. McCracken notes that it was probable that Damaris was not baptized immediately after birth as her first child was born 1727. Mr. Gamaliel Ward informed the Simsbury clerk that the first eight of his children were born at Hartford (L. B. Barbour found no births recorded there), but he did not say this until after the birth of the 10th, when his memory may have been hazy. The Ward Genealogy, cited above, says that the first five were born at Union, the 6th at Somers. William Gamaliel Ward was born on 2 October 1694. He was the son of William Ward. William Gamaliel Ward married Damaris Holcombe, daughter of Sgt. Jonathan Holcombe and Mary Buell. William Gamaliel Ward died on 6 June 1774 at Simsbury, Hartford Co., CT, at age 79. [S58] Andrew Henshaw Ward, Ward Family, Page 37. Obadiah Ward was the son of William Ward. McCracken notes that his death was either 29 July 1737 according to Simsbury Records, or 13 July 1737 according to Manwaring (3:286). Jocob's inventory of £78/07/05 was taken 14 Oct 1737 by James Hillier, James Smith and John Wilsoxson 2nd; distribution gave £33/15/03 to widow Margaret; to Azariah Holcomb £11/1/3; to Damarus Ward alias Holcomb and to Mary Holcomb [not yet married] £L11/05/03 each. This shows there was no posthumous child. Deanna Bowman shows Damaris as a daughter of Sgt. Jonathan Holcombe and mary Buel (Vol 1, page 73). Given that Ruth shows that Jacob and Margaret Had 3 children between when they were married Feb. 10, 1736, and when he died July 27, 1737, it seems unlikely that these were their children. Perhaps they were from an unrecorded earlier marriage of Jacob's? Seaver does not mention this child. In McPherson, page 194, Mary who on 15 August 1739 married Amos Case is misidentified as the daughter of Samuel Holcombe, whereas she was the youngest of the seven children of Jonathan Holcombe. His will dated 29 May 1759 refers to her as "Mary, wife of Amos Case. " In the will of her brother Jacob, who died 29 July 1737, before her marriage, she is referred to as "sister Mary." The will of her grandfather, Peter Buell, also refers to her as "Mary Case," along with Damaris Ward and Azariah Holcomb, called children of Jonathan Holcomb. 4 Mary Holcombe was born on 10 July 1717 at Simsbury, Hartford Co., CT. She was the daughter of Corporal Samuel Holcombe and Martha Phelps. Mary Holcombe died on 27 January 1802 at age 84. [S65] Deanna Holcomb Bowman Thomas Holcomb, Vol. I:Pg 27, 73. [S709] George E. McCracken, "Mary Holcombe." Amos Case was born in 1712 at Simsbury, Hartford Co., CT. He was the son of Bartholomew Case and Mary Humphrey. Amos Case married Mary Holcombe, daughter of Sgt. Jonathan Holcombe and Mary Buell, on 15 August 1739 at Simsbury, Hartford Co., CT.3 Amos Case died on 24 May 1798. [S94] Nathaniel Goodwin, Genealogical Notes, or Contributions to the Family History of Some of the First Settlers of Connecticut and Massachusetts, Page 291/Item 348. [S101] Ruth Cost Duncan, John Case, Page 15/Item 21. Seaver indicates that he moved with his brother Jonathan to St. Albans, Vt., an opinion which McPherson shares. DAR records seem to indicate otherwise, showing his death in Massachsetts. McCracken asks: Did he marry Mary Hillyer, daughter of James and Mary (Humphrey)Hillyer? He is mentioned in his grandfather's will and was probably living 1790 in Sheffield, MA (3/0/2), next to Plinny (1/1/1). Michael served as a 2d Lieutenant, Capt. John Spoor's 2d co. (West co. in Sheffield), 1st Berkshire Co. regt. of Mass. militia; list of officers chosen by the several companies in said regiment, as returned by Mark Hopkins and others, field officers, dated Great Barrington, March 26, 1776; ordered in Council May 6, 1776, that said officers be commissioned; reported commissioned May 6, 1776; also, Lieutenant, Capt. John King's co., Col. Hopkins's (Berkshire Co.) regt; entered service July 15, 1776; discharged Aug. 4, 1776; service, 20 days; mileage out and home (180 miles) allowed; company marched by order of Brig. Gen. Fellows; also, 2d Lieutenant, Capt. Ephraim Fitch's (4th) co., Col. Benjamin Simonds's detachment of Berkshire Co. militia; muster roll dated Camp at Ticonderoga, Feb. 25, 1777; entered service Dec. 16, 1776; engagement to expire March 15, 1777; also, Capt. Ephraim Fitch's co., Col. Benjamin Simonds's detachment; return dated Sheffield, May 1, 1777, signed by John Fellows, of a detachment made from said Fellows's (Berkshire Co.) brigade, to reinforce the Continental Army, agreeable to order of General Court, and which marched the beginning of Jan. ; also, Lieutenant, Capt. John Spoor's co., Col. John Ashley's (Berkshire Co.) regt; entered service July 7, 1777; discharged July 28, 1777; service, 22 days; company marched to Kingsbury near Fort Ann; also, same co. and regt; entered service Sept. 19, 1777; discharged Oct. 19, 1777; service, 31 days; company marched to Stillwater; roll certified at Sheffield by Brig. Gen. John Fellows; also, 1st Lieutenant, Capt. John Spoor's (2d) co., Col. Asheley's (Ashley's) 1st Berkshire Co. regt. of Mass. militia; list of officers; commissioned June 9, 1778; also, 1st Lieutenant, Capt. John Spoor's co., Col. John Ashley's (Berkshire Co.) regt; engaged Oct. 15, 1780; discharged Oct. 17, 1780; service, 4 days; company marched to the Northward by order of Brig. Gen. Fellows on an alarm at the time Forts Ann and George were taken by the enemy. McPherson only lists one child, Mary. Norment lists others. [S25] Hannah McPherson, Holcombe Genealogy, Page 197.2/Item A-8-3-3-2. This child not mentioned by Seaver. McCracken notes he was not in grandfather's will in 1759, so perhaps not the Plinny living next to Michael in 1790 at Sheffield, MA (1/1/1). Also not mentioned by Ruth Cost Duncan. Pliny Holcombe was born on 19 August 1735 at Simsbury, Hartford Co., CT.1 He was the son of Jonathan Holcombe and Amy Case. Amy Holcombe was the daughter of Jonathan Holcombe and Amy Case. Not mentioned in Seaver, but McCracken notes that she was mentioned in grandfather's will, 1759. Could this be the daughter "Ann" listed by Ruth Cost Duncan? Birth is noted by Seaver as 173-. Abigail Hillyer was born on 13 February 1730. She married Jonathan Holcombe, son of Jonathan Holcombe and Amy Case, at Granby, Hartford Co., CT. Abigail Hillyer died on 10 April 1813 at St. Albans, VT, at age 83. Hannah (?) married Philip Loomis, son of Lt. Samuel Loomis and Elizabeth Judd, in 1704. The Vermont Historical Gazetter, Vol, *, pt 1, pg 83, indicates they moved in 1802 to Westport, VT. Simsbury records, Loomis, and Weir indicate that they had the following children. Seaver has this family confused with others, among them his son, Abner G., and with Abner Johnson Holcomb, the ancestor of Deanna Holcomb Bowman. 9. Welthia m. Calvin Hammond. [S23] Jesse Seaver, The Holcomb(e) Genealogy, Page 69. [S25] Hannah McPherson, Holcombe Genealogy, Page 198.1/Item A-8-3-4-1. [S45] Albert C. Bates, Simsbury, Page 129. [S25] Hannah McPherson, Holcombe Genealogy, Page 198.1. [S810] Edwin W. Strickland II, William Buell, 1-8, page 177. Elizabeth Holcombe was born on 18 May 1733 at Simsbury, Hartford Co., CT.1 She was the daughter of Deacon Azariah Holcombe and Hannah Loomis. Eldad Holcombe was born on 9 January 1734/35 at Simsbury, Hartford Co., CT.5,6 He was the son of Deacon Azariah Holcombe and Hannah Loomis. Eldad Holcombe married Michal Church, daughter of Samuel Church and Elizabeth (? ), on 23 December 1756 at Granville, Hampden Co., MA. 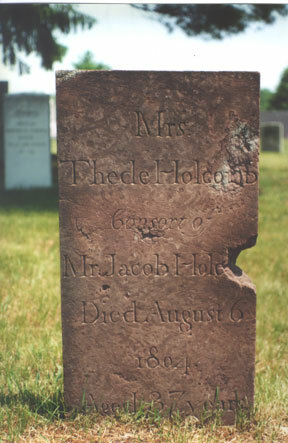 Eldad Holcombe died in 1789 at Granville, Hampden Co., MA. Corporal, Capt. William Cooley's Co., Col. John Mosley's (Hampshire Co.) Regt; engaged Oct. 21, 1776; discharged Nov. 17, 1776; service, 28 days; mileage out and return (320 miles) allowed; company marched under command of Lieut. Col. Timothy Robinson to reinforce Northern army; roll dated Granville; also, Sergeant, Capt. Aaron Coe's co., Col. John Moseley's (Hampshire Co.) regt; entered service Sept. 21, 1777; discharged Oct. 23, 1777; service, 33 days; company marched by order of Gen. Gates to reinforce Northern army on an alarm. "Massachusetts soldiers and Sailors in the Revolutionary War, Vol. 8, page 91, lists two Eldad's, one being listed as "3d" . Seaver and Loomis list the first three children, Weir add the last three. [S65] Deanna Holcomb Bowman Thomas Holcomb, Vol. I:Pgs. 163-4/Item 8343. [S104] DAR DAR Lineage book, Vol. 127:Pg. 228/Item 126725. [S25] Hannah McPherson, Holcombe Genealogy, Page 200.1/Item A-8-3-4-3. [S25] Hannah McPherson, Holcombe Genealogy, pages 197.2 amd 200.1, item A-8-3-4-3. [S25] Hannah McPherson, Holcombe Genealogy, page 200.1, item A-8-3-4-3-2. [S25] Hannah McPherson, Holcombe Genealogy, page 200.1, item A-8-3-4-3-3. [S25] Hannah McPherson, Holcombe Genealogy, page 200.1, item A-8-3-4-3-6. [S25] Hannah McPherson, Holcombe Genealogy, page 200.1, item A-8-3-4-3-7. [S25] Hannah McPherson, Holcombe Genealogy, page 200.1, item A-8-3-4-3-8. Obed Holcombe was born on 8 January 1736/37 at Simsbury, Hartford Co., CT.3 He was the son of Deacon Azariah Holcombe and Hannah Loomis. Obed Holcombe married Mercy Holcombe, daughter of Capt. Nathaniel Holcombe and Thankful Hayes.4 Obed Holcombe died in 1789. Served as a lieutenant in Capt. Johah Gilett's company, Wadsworth's brigade, Connecticut Line. Obed moved to Panton, Addison Co., VT, in 1795; to Isle-La-Motte, Grand Isle Co., VT in 1800, later settling in Lewis, Essex Co., NY. Obed's birth is given as 8 June 1736 in McPherson5. [S25] Hannah McPherson, Holcombe Genealogy, Page 203.1/Item A-8-3-4-4. [S25] Hannah McPherson, Holcombe Genealogy, Page 203.1. [S25] Hannah McPherson, Holcombe Genealogy, page 197.2. Bethia Holcombe was born on 22 January 1740/41 at Simsbury, Hartford Co., CT.1 She was the daughter of Deacon Azariah Holcombe and Hannah Loomis. [S45] Albert C. Bates, Simsbury, Page 96. Mary Holcombe was born on 21 May 1744 at Simsbury, Hartford Co., CT.1 She was the daughter of Deacon Azariah Holcombe and Hannah Loomis. Lt. Benjamin Holcombe was born on 3 March 1745/46 at Simsbury, Hartford Co., CT.3 He was the son of Deacon Azariah Holcombe and Hannah Loomis. Lt. Benjamin Holcombe married Mary Kendall, daughter of Ebenezer Kendall and Mehitable Holcombe.4 Lt. Benjamin Holcombe died in 1817 at Essex Co., NY. Seaver notes that wife could have been Mary or Mercy and questions if Ebenezer was her father. Seaver and Loomis list 7 children, Weir lists 7 others. [S25] Hannah McPherson, Holcombe Genealogy, Page 205.2/Item A-8-3-4-8. [S104] DAR DAR Lineage book, Vol. XXVII:Pg. 196/Item 26531; Vol. XXXI:Pg. 40/Item 30113 and 30114; Vol. XXXII:Pg 7/Item 31014; Vol. LXVII:Pgs. 210, 212, 213, 214, 215/Items 66570, 66578, 66582, 66584, 66585, and 66589; Vol. LXXVII/Page 209/Item 76554; Vol. LXXIII:Pg. 175/Item 82456. Benjamin Sullivan Holcombe was the son of Lt. Benjamin Holcombe and Mary Kendall. Harvey Holcombe was the son of Lt. Benjamin Holcombe and Mary Kendall. In an ironic difference, McPherson and Seaver have confused this John, born 1782 in Ct.
Seaver says this John is his Great Grandfather, but that he is descended from Thomas-Joshua-Joshua-Phineas-John; on Page 20 of his book. For now, Seaver himself appears where he wanted, under the Joshua line, while further research is done. Finding birth records in CT will not be very helpful, there were apparently two Johns who went with their fathers John and Benjamin, to Panton, Vt. Perhaps wills or probate records will help. John was a farmer, stockman,"champion" deer hunter and trapper in the Adirondack Mountains, NY. During the War of 1812, while at his hunting shanty in the mountain forest, he was captured by the Indians and sold to the British as a prisoner of war. His family considered him dead, but after a time, when it was ascertained that he was not a soldier, he was liberated and returned home. After his release he moved to Cattaragus Co., NY. During his absence, his wife "distributed" the children among relations. John Holcombe married Mary Lynde, daughter of Jonathan Lynde and Molly Franklin. John Holcombe was born in 1782. He was the son of Lt. Benjamin Holcombe and Mary Kendall. [S25] Hannah McPherson, Holcombe Genealogy, Page 206.1/Item A-8-3-4-8-2. Lyman Hardy Holcombe was the son of Lt. Benjamin Holcombe and Mary Kendall. Gravestone has Louis instead of Lois. Respected in life and lamented in death. [S65] Deanna Holcomb Bowman Thomas Holcomb, Vol.I:Pg 72.